This is a 3/4 Oz. Glass Paint Jar with Cover from Badger. Retail $1.60 SAVE 24% ! This glass jar uses a foam gasket to seal the plastic lid. Paint thinner dissolves that foam gasket, leaving blobs of plastic in the paint. These blobs play havoc with the airbrush and the painted finish on the model. Before using, replace the gasket with something impervious to paint thinner (cork, nylon, a durable cardboard, etc.). 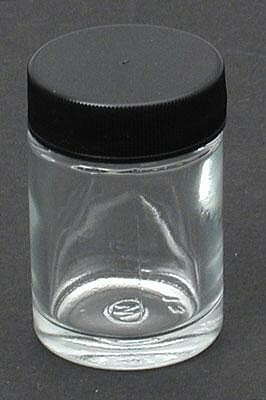 Clear glass jar with black plastic lid. Fits Models 150, 155, 175, 200, 250, 350 and 360. One 3/4 Oz. Glass Paint Jar with Cover. great paint jars for mixing colors to be air brushed. "Foam gasket inferior to cork"
Badger must&apos;ve cheapened their design. My 20 year old Badger 200 color cups with cork gaskets are still working well. I put lacquer thinner into this jar and sealed the lid, never tipped or shook it, and the next day the vapors alone had melted the foam gasket into a gooey slime ball. Fortunately it came off pretty much in 1 piece. But now I have a gasket less jar... Paasche still uses nice cork gaskets in their color cups and siphon jars which are virtually Identical to these and also inexpensive.